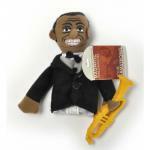 Browse our unique selection of musical finger puppets and composer dolls by the Unemployed Philosophers and Alfred's Music for Little Mozarts designed to encourage an early love and appreciation of music for your children. 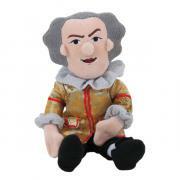 Bach, Mozart and Beethoven Little Thinkers are musical and play their famous compositions — including "Joy of Man's Desiring" "Eine Kleine Nachtmusik" and "Moonlight sonata." These colorful and friendly musical toy dolls and finger puppets are designed to be an inviting introduction to the world of music while other Items in our Dolls and Plush Animals Department feature familiar childhood figures like Elmo, Mother Goose and others who sing sleepy time songs, the ABCs and other popular tunes like "Here Comes Peter Cottontail" and "B-I-N-G-O" that play in our Jack-in-the-boxes.